Equine Glucosamine supplements are widely recommended by vets to be fed to horses with arthritis and conditions such as bone spavin. Glucosamine is a naturally occuring compound found in cartilage and other connective tissues in a horse's body. It is used by the horse to maintain and repair cartilage in its joints. It also plays an important part in controlling the inflammatory processes. Glucosamine is a type of sugar, produced in the body from glucose together with glutamine - an amino acid. As a horse gets older its natural production of glucosamine slows down - feeding a supplement can help protect a horse from the consequences of this ageing process. In osteoarthritis in a horse or pony the cartilage which cushions the joints loses its elasticity and becomes stiff. This loss of elasticity in a horse's joint makes it more prone to damage as it loses that protection. This can lead swelling, pain and result in further deterioration, loss of movement and lameness. If a glucosamine supplement is added to a horse's feed on a regular basis, production of cartilage within the joint is stimulated. 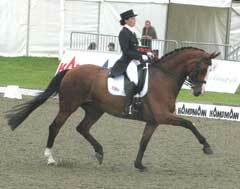 This can slow down the deterioration of the joint and in many cases an improvement in the horse's movement is seen. It is generally recommended by vets that it is best to feed a horse that has osteoarthritis at least 10 grams of glucosamine a day. This can be increased - very good results have been seen with a daily dose of 30 grams. Glucosamine supplements often also contain chondroitin sulfate which gives the cartilage elasticity and/or methylsulfonylmethane (MSM). These combinations of ingredients help to provide the maximum benefit. Please consider the source when choosing a glucosamine supplement - some supplements are manufactured using shark’s cartilage despite all species of sharks being under threat. Sources of glucosamine such as shellfish are ethically produced, sustainable and as effective as shark’s cartilage.